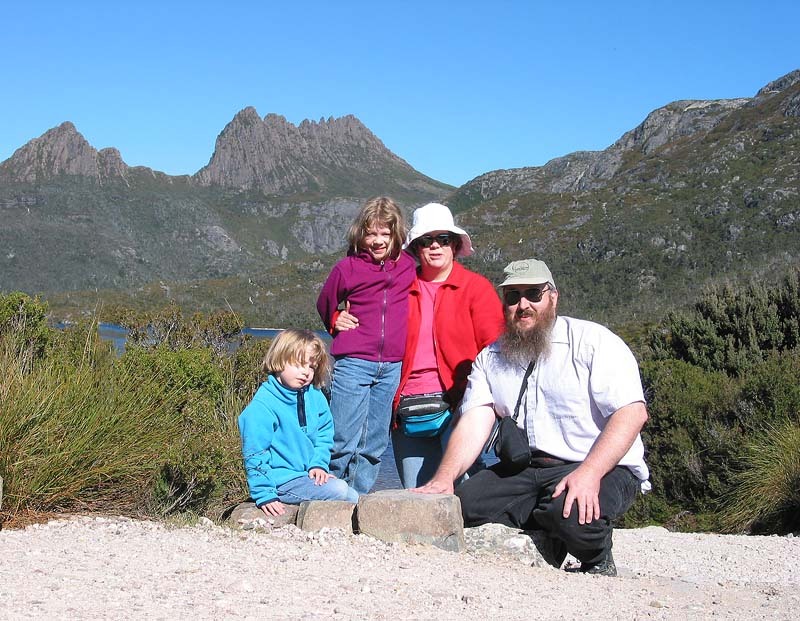 May 1, 2002 - A Few More Tassie Pictures: A few more pictures and words on the Tassie pages. 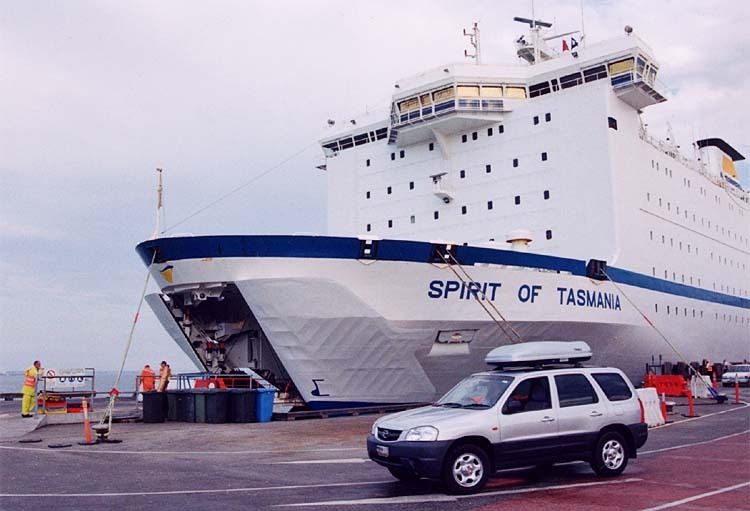 May 2, 2002 - Aren't we through with Tasmania yet! 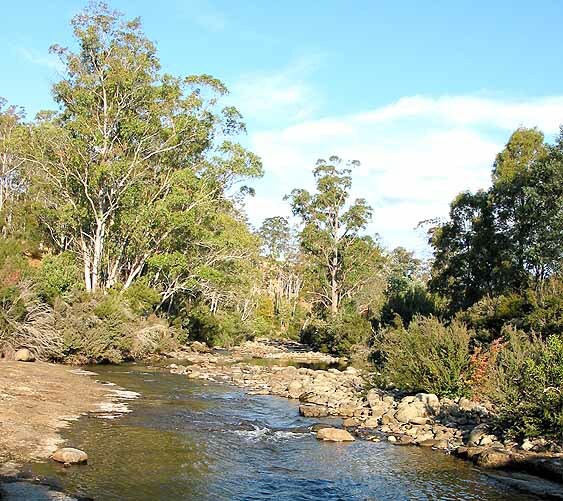 : A last few pictures and words on the Tassie pages - then we'll give it a rest, before going back and rewriting it, and adding more pictures. We've slowly gotten the house put back together this week after we had packed many things away for the refurbishing while we were gone. Tomorrow is going to be another exciting day for the girls, since they are going to a birthday party / sleepover at the house of friends / schoolmates Allanah and Jessica. 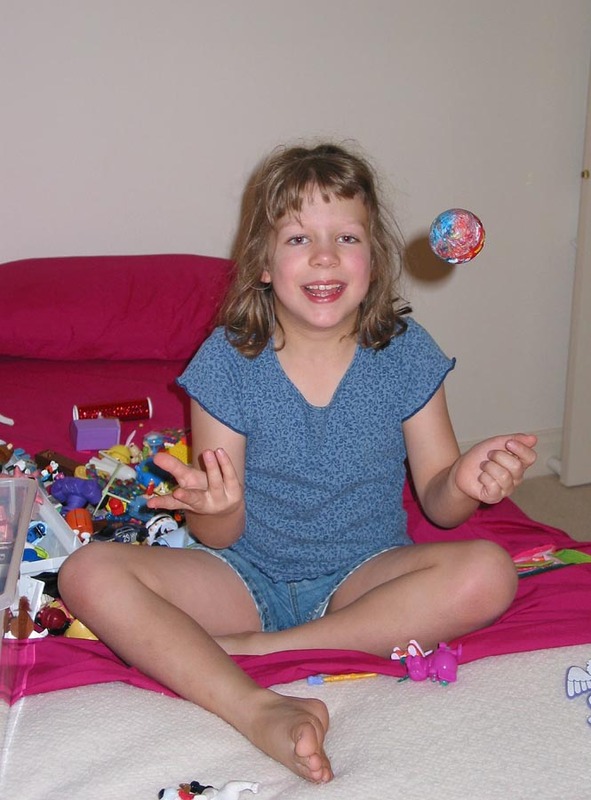 And then on Monday, Lucy goes in for her tonsillectomy - so it is good she's getting a fun weekend first! 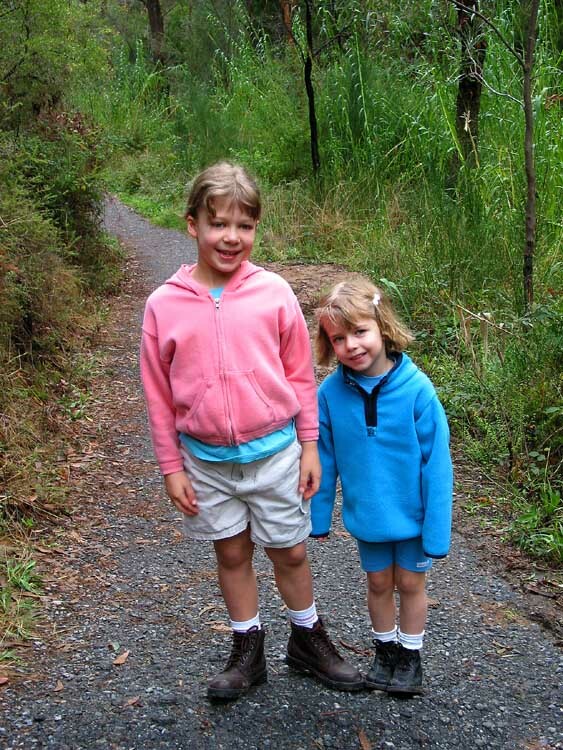 May 3-6, 2002 - Sleepovers and Tonsils: As promised, no changes to Tasmania page this time around. 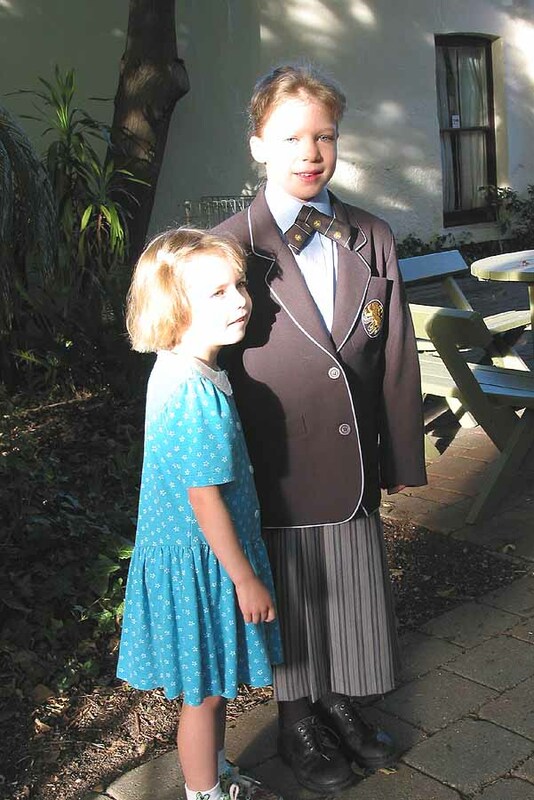 We did add some pictures to the Oz Pictures page, including this rather washed-out one of the first day of term 2, which shows Clara in the new winter uniform. Friday night, Clara and Lucy joined 12 other girls for a birthday party / sleepover - what an event! Sandy picked up Clara and Lucy and two other girls after school at Wilderness and took them over; then Sandy stayed to help Chris and Jacquie manage the girls until they were in PJs and settled down for a movie about 9pm. The girls had a great time, playing on the beach, "disco dancing" in the house, dressing up and acting out roles for each other to guess, cake and ice cream, and movie. Apparently, some of the girls got up quite early on Saturday - not surprisingly, Lucy was the last one up. Sandy picked Clara and Lucy up; they played for a while at home, but shortly after lunch, Sandy, Clara & Lucy had to take power naps to make up for it! Sunday was a quiet day around the house. Tuesday morning, Lucy was a lot perkier, and ate a large breakfast, with no complaints about her throat. We took her home, and popped her in the shower - where she promptly resumed her normal shower routine of singing - which, after a while, brought about a complaint that her throat hurt - small wonder! 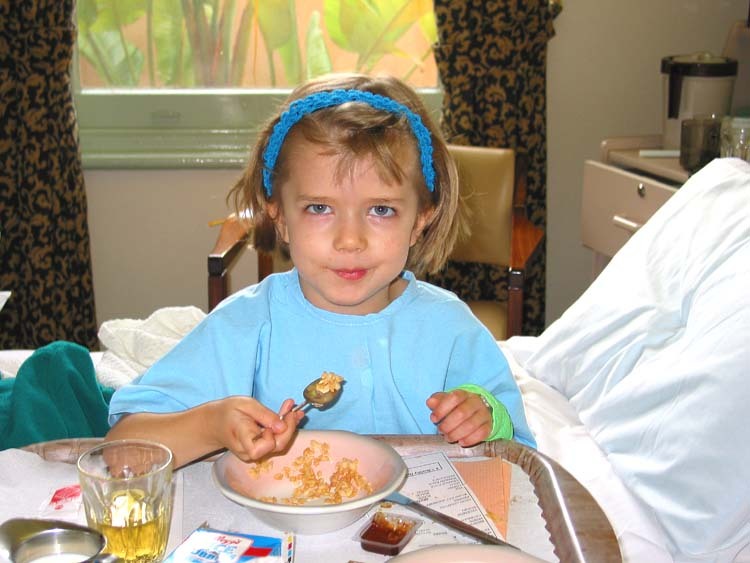 May 7-12, 2002 - Recovery and Mother's Day: Lucy continued on the mend, while Clara settled back into the school routine. 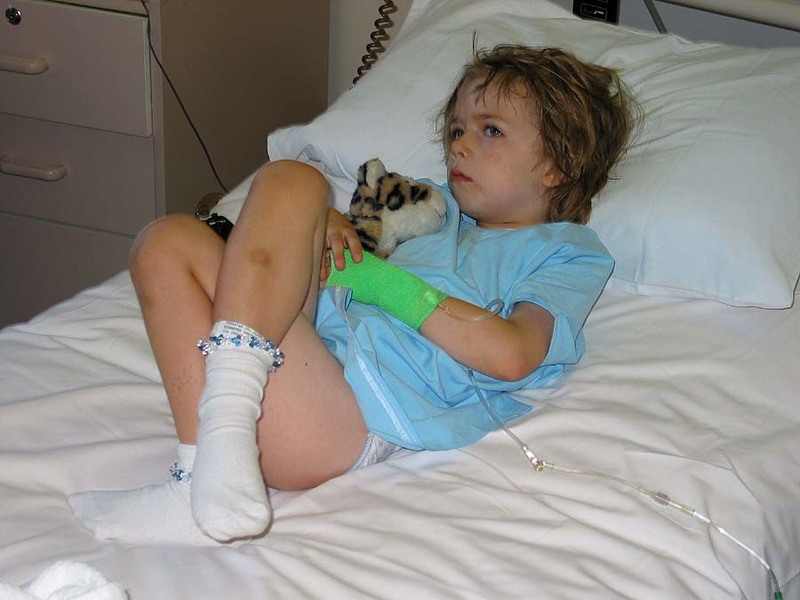 Tuesday night, Lucy was up a couple times for more Panadol (the Australian version of Tylenol). 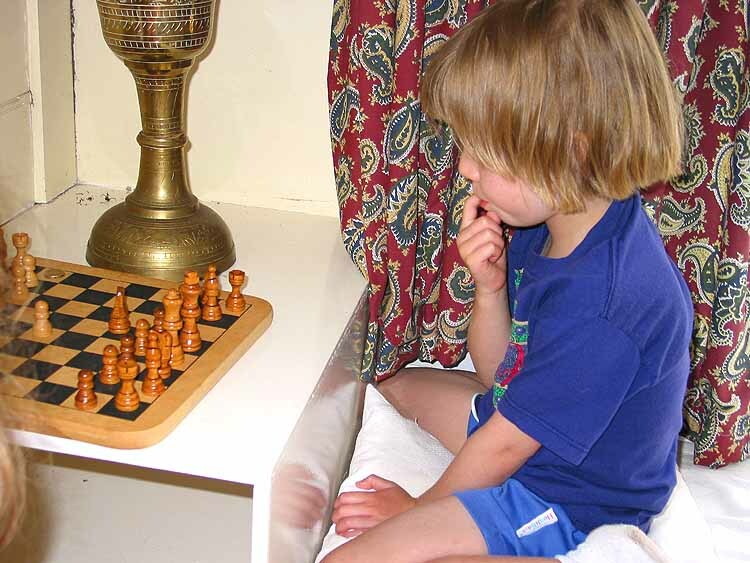 Wednesday was a light day for everyone, and in the evening, Clara and Lucy got out the chess set and worked at learning the game. Lucy has been asking Sandy to teach her to cross stitch ever since the girls in Clara's class learned, so Sandy and Lucy used the quiet days this week for Lucy to start stitching a yellow and green butterfly. Wednesday night, Lucy made it through the entire night without any additional Panadol. We also got the pathology report on Lucy's tonsils, which was negative, making us all feel better. Thursday, Sandy & Lucy took Clara to school, then walked down to visit Lucy's classroom and teachers. Lucy had been worried that she wouldn't make it back to school before Mother's Day, and would not be able to bring home the surprise she made for Sandy. 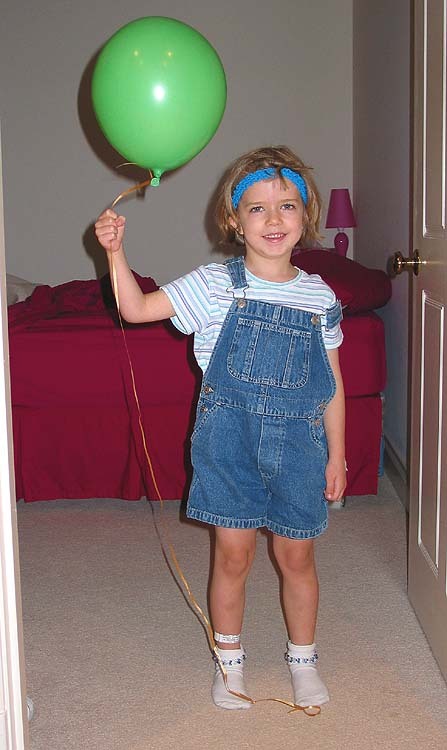 They also fit in some other errands, including the purchase of new sneakers for Lucy - with flashing red lights in the soles, which thrilled Lucy no end. Then it was back to school for Clara and home again. Friday, Lucy's class sent home a get well card with Clara. Saturday was a day of more errands, and getting ready for our evening with Chris, Jacquie, Allanah, and Jessica. Instead of going out on Mother's Day, when the restaurants are crowded, we decided to go out Saturday night. However, Sandy couldn't resist baking an apple crisp for dessert. They arrived about 4pm, and the four girls disappeared upstairs. After our return from a Mexican dinner, the girls donned their costumes (Allanah the Butterfly Fairy, Clara the Cat, Jessica the Fairy, and Lucy the Bunny Rabbit) and put on a play for us. On Mother's Day, Tim, Clara & Lucy cooked a fancy breakfast for Sandy. Then, it was just a day of puttering around, reading books, etc. 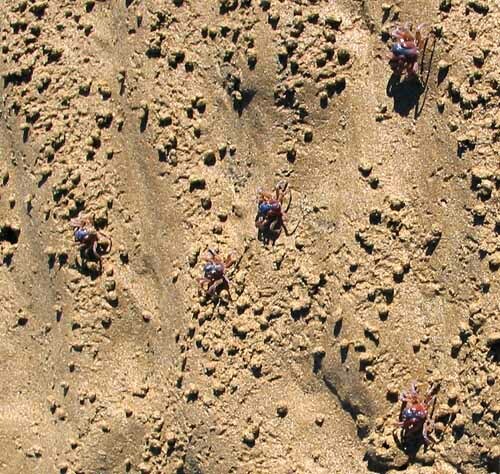 We've also put a couple more pictures on the Tassie picture page, of soldier crabs and the Repulse River. This week we have been feeling like autumn is really here. Lots of leaves have fallen, and there have been gusty winds and heavy rains. Wednesday after school, Sandy and the girls were caught in a heavy downpour and were truly drenched by the time they reached the car. Thursday, Sandy and Jacquie went off to the New Settler's group. Thursday evening, Tim came home early from work so that we all could go out for dinner to an Indian restaurant. Clara's class at school is investigating India for several weeks, so armed with notebook and pencil, we all sampled a variety of Indian foods, mostly from the northern part of the country. Tim decided to take Friday off, since the Boeing team is arriving again for two big reviews plus a trip to Melbourne in the next two weeks. Sandy took Clara to school, then went off to visit sewing machine dealers and quilt stores. Tim and Lucy stayed at home, where Lucy skunked Tim at Uno, and did some drawing. Then they went off to the library, zoo, and finally to pick Clara up. Saturday morning, Rosemary picked Sandy up at 8 am, and they went off to the Central Market. They were back within a couple hours, which surprised Tim, who expected them to be gone til early afternoon - but the market was nearly deserted that early, and they both had things to do this afternoon (we're all going over to Rosemary and Craig's tomorrow for dinner and a visit anyway). It was raining pigs and sheep (Tim, Clara & Lucy had a long discussion as to just how hard it was raining - was it cats and dogs, pigs and chickens, or what. They finally settled on pigs and sheep), and some of the streets couldn't handle the runoff and flooded. We have had no drainage problems at our house yet. So, they couldn't head off to the park as planned. Since Clara was having a friend from school over in the afternoon, Tim went out and finally got a transformer to run the LGB train which we brought with us. After lunch, Tim, Clara and Lucy set it up, and got it going just as Katerina arrived. 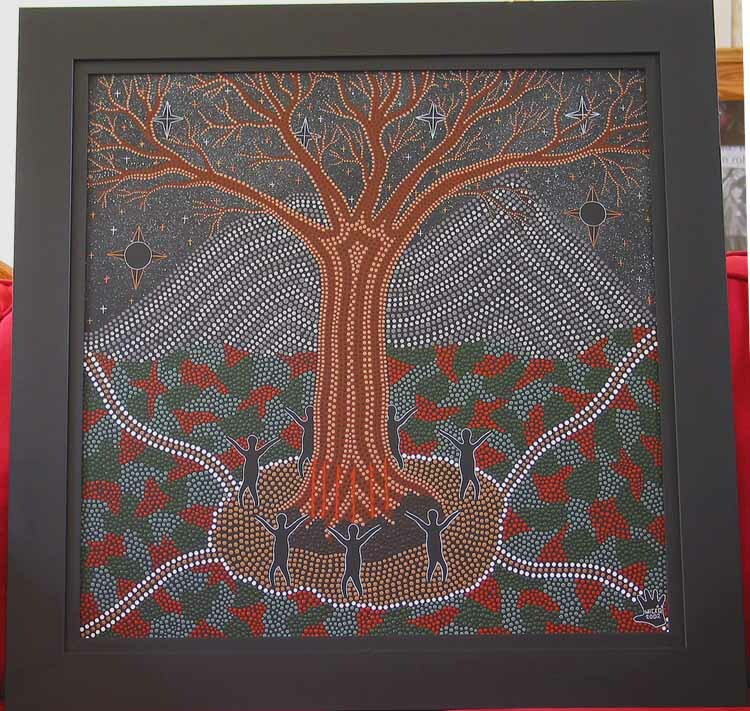 We took a picture of the traditional dot painting by Tasmanian Aboriginal artist "Mick Q" which we acquired in Tasmania. The painting features the Tree of Life, with a mountain backdrop. There are also a couple new pictures on the Tassie picture page; these were scanned-in versions of pictures taken by the ship's photographer. 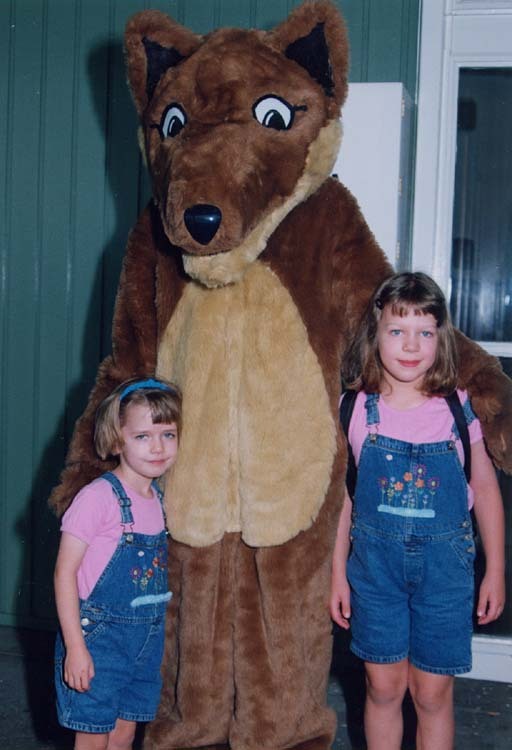 One if of the Tribute as Tim drove it around to board, the other is of Lucy & Clara with the Tassie Tiger character. Oh, and what's that in the title about Adelaide Cup Weekend? Well, any excuse for a long weekend is a good one in Australia, and Adelaide Cup Day is Monday, and is an excuse for the city to shut down for the horse races (similar to Melbourne Cup Day). 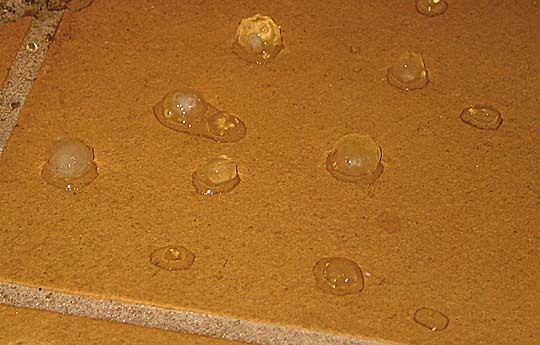 May 19-26, 2002 - Another week: Saturday evening, the rains really arrived, including some substantial hail of 1/2 - 3/4 inch diameter. We've had so few storms since we arrived that this series of thunderstorms seemed especially spectacular to us, and made it hard for the girls to sleep. 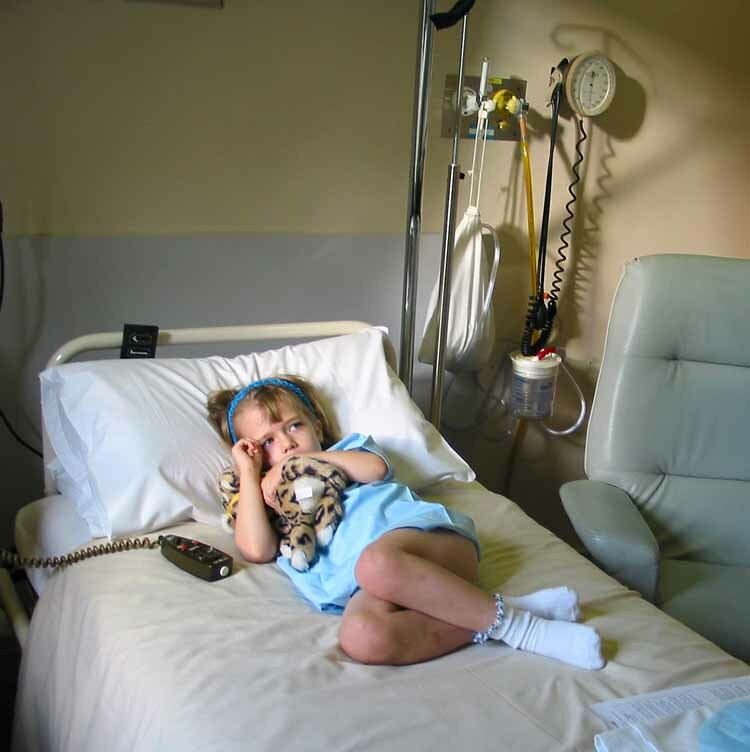 Lucy, in particular, slept lightly, and when Tim went in to check her before he went to bed, she jumped and squeaked when be adjusted her blanket - and usually you could march a band through her bedroom without distubing her. Sunday, we went over to Craig & Rosemary's, and had a very nice dinner, followed by a scotch tasting for Tim & Craig. We also sampled one of the newly released red wines from our landlord's winery, Kirihill Estates, and it was very well received all around. Sandy made fudge brownies and Rosemary made date squares, both of which the girls enjoyed. Monday, Tim, Clara and Lucy went to Waterfall Gulley for a walk. They made it as far as the second falls before turning back. Since it was a nice day at the time (the clouds returned later) and a public holiday, there were quite a few other people out taking advantage of the day for a hike. Tuesday evening was quite exciting, as Clara (and the rest of her class choir) made it on to TV. The Year 3 and 4 girls choir had performed at a SIDS fundraising benefit that morning, and two of the local stations featured the girls in a short clip at the end of the evening news. Thursday, Clara had a long day - first thing in the morning was the "cross country" run around the parklands for the junior girls (it had been postponed from last week due to rain). Then she had PE during the day, followed by a double tennis lesson (to make up for one missed when her teacher was on a trip to Vietnam). So she was pretty well ready for bed when she got home (although she continued to claim she was not tired right up until her head hit the pillow). Friday, Saturday and Sunday were spent on errands, chores around the house, violin practice, homework - the usual weekend routine. Could it actually be that after about nine months, life here in Australia is finally "normal?" May 27-June 5, 2002 - Tonsilitis Returns! : Monday, both girls had a good day at school, and Sandy narrowed in on her new sewing machine. Tuesday, Tim flew to Canberra for a meeting, then on Wednesday, rode with a group of guys he works with to Sydney for another meeting. He was back home Thursday night. Unfortunately, he didn't have time to go to Starbucks in either place - but, the Boeing team brought some Starbucks beans for both him and Chris, so he was happy with that. Friday night, we all watched the Harry Potter movie at home. During some of the scary scenes, Lucy (and a couple of times Clara) would jump up and come snuggle with Tim and Sandy; then, as the tension eased, they would get back down again! It was a fun movie, but perhaps not as good (at least to Tim) as listening to Jim Dale's audio version on cassette tape. Saturday morning, it was back to the doctor time - both Clara and Sandy have been feeling under the weather (Lucy had even been staying "perky" longer in the evenings, and getting up earlier than Clara). Turns out Clara has - surprise! - tonsillitis!! So, our doctor recommended visiting an ENT regarding a possible tonsillectomy. For today, she got an antibiotic and a future appointment with an ENT specialist. Sandy turned out to be suffering from sinusitis, and also came home with an antibiotic. Last web page update was July 13, 2002.